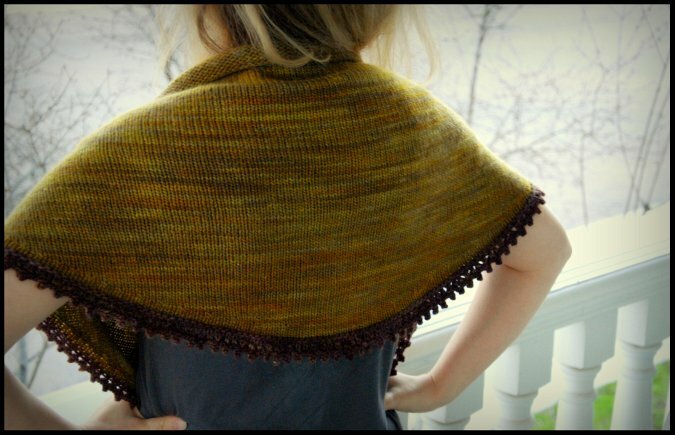 Meet "Cosette", my newest shawl design! 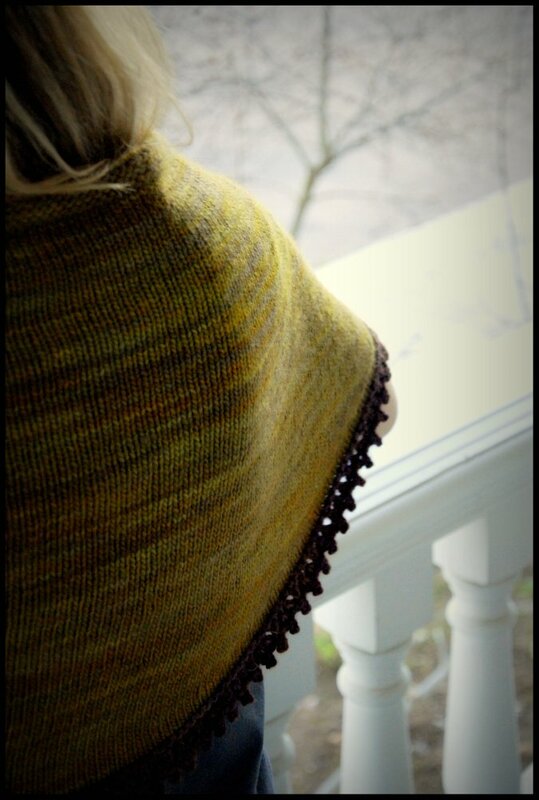 Cosette is a large cozy wrap to keep you warm in cool weather. The curved shape with tapered ends is very versatile and lends itself to being perfectly draped over your shoulders and tied in front. Or for a dressier accent to your outfit you could fasten Cosette with a brooch like I have in the above picture. 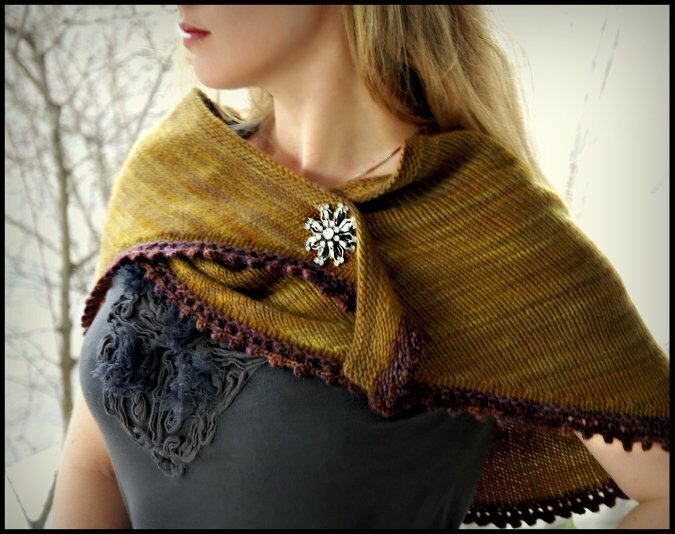 But if shawls are not your thing.. Cosette works beautifully wrapped and tied around your neck as a scarf. It would look great under a winter coat with just a little color peeking through. 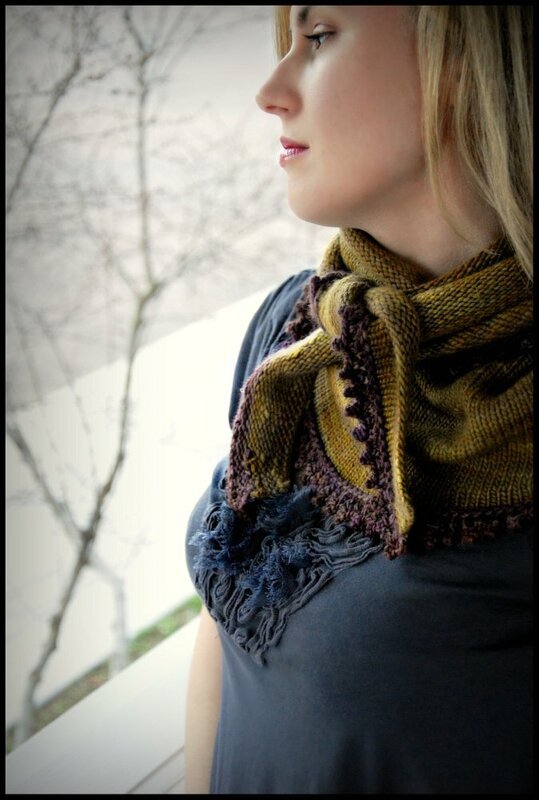 The yarn that I chose for this design is one of my favorites, madelinetosh. 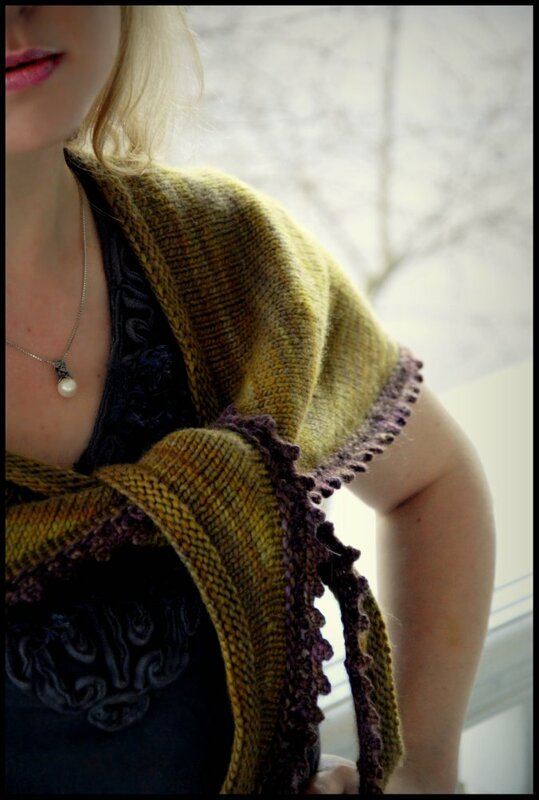 The body is made up of Tosh Merino in Olivia and the border is worked out of Eyre in the Fig colorway. This beautiful color combination came about my accident. but was continually fascinated by how well they worked together. I think that the combination makes for a very rich looking piece. Also the Tosh Merino is such a wonderfully cozy yarn. I reviewed it in Episode 30 of my podcast if you would like to find out more about it. I think that the super soft merino wool paired with the eyelet picot border makes Cosette the perfect balance of functionality and feminine style. 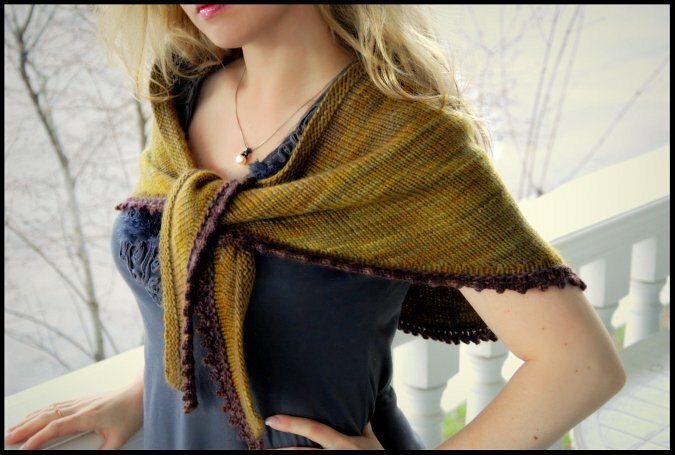 The deep curved shape of the shawl is created by use of short rows. This is the same technique I used in shaping the Cedar Leaf Shawlette pattern. Short row shaping is great. I like how it creates shapes invisibly and cleanly. The pattern contains detailed instruction for the short row technique. But here are two instructional videos that may prove helpful as well. Click HERE and HERE. Width: measures approx 16.5 inches at deepest point of center including eyelet picot border. [MC] Madelinetosh Tosh Merino [100% Merino Wool; 210 yd/192m per 90g skein]; color: Olivia; 3 skeins or approx 500 yds of a worsted weight wool or wool blend. [CC] Madelinetosh Eyre [60% Merino Wool, 20% Baby Alpaca, 20% Silk; 120 yd/110m per 60g skein]; color: Fig; 1 skein or approx 75 yds of a worsted weight wool or wool blend. 16 sts/30 rows = 4" in Stockinette stitch on size 8 needles or size needed for accurate gauge. I hope that you enjoy knitting and wearing it! Cosette is now available in French! Click HERE to purchase the French version!